A Belfast man with a history of harassing an 82-year-old woman was back in court on Tuesday accused of breaching a restraining order. Morrison Wilson, from Belle Bashford Court in the east of the city, has been charged with entering Rotterdam Court in Belfast on Monday when he was banned from doing so due to an existing court order. The 61-year-old appeared in Belfast Magistrates’ Court after a warrant was issued for his arrest. 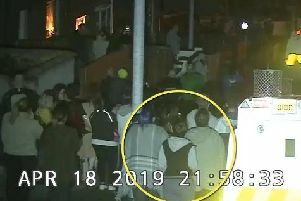 A police constable said police were “strongly opposing” bail, and revealed the injured party was a “vulnerable” 82-year-old woman who was living in fear. She said Wilson had a history of issues with his former neighbour which spanned five years. Wilson was handed suspended sentences in 2013 and 2014, and had served a 10-month prison sentence. Telling District Judge Bernie Kelly that due to this week’s alleged breach of the restraining order “I fear for this lady’s safety”, the policewoman said the order was granted in May 2016 and is valid until 2018. She also said that after seeing Wilson in Rotterdam Court on Monday, the pensioner was left in “complete shock”, is now frightened and she “does not feel safe in her own home”. Ms Kelly said that in light of police concerns, she was refusing to release Wilson on bail, and remanded him into custody. After informing Wilson he had the right to appeal her decision, he was told he would appear before the same court via video link on Thursday.